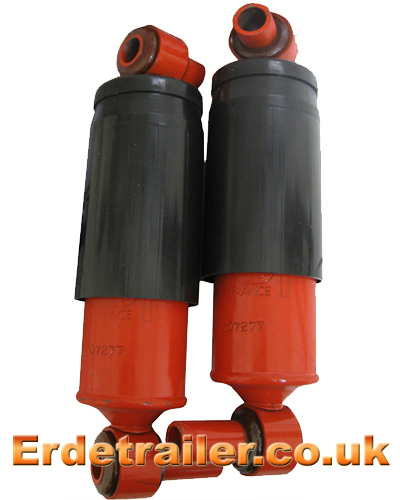 Erde make a range of shock absorbers to fit their range of trailers (excluding the 102 model). Shock absorbers are designed to dampen the movement of the suspension arm. A trailer with shock absorbers will have less strain on its axle, which will give a smoother ride and increase the trailers life. These shock absorbers are supplied with all the fixtures and fittings needed to install them. accessories that not every trailer owner will agree on. It depends on what your trailer is carrying and what terrain you are towing on. For regular road use, towing loads like garden waste ect. your trailers standard rubber torsion suspension should easily be sufficient.